I’m a huge Jillian Michaels fan. I managed to watch a series of The Biggest Loser US that she featured on, and I absolutely loved her attitude, her spark, and her committment to helping people lose weight and, in turn, change their lives completely. It was Jillian’s DVD workout 30 Day Shred that really kicked my weight loss for my wedding into gear, and ever since then I’ve only really ever used her workout DVDs – once you’ve sweated with Jillian, there doesn’t seem to be a workout to match it! I also love listening to her podcasts, too. 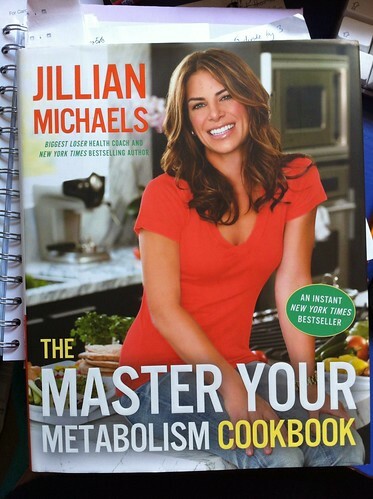 Anyway, as part of my ‘I Love Jillian’ kick, I picked up her recipe book, The Master Your Metabolism Cookbook. This is intended as a companion book to Master Your Metabolism, in which Jillian looks at the science behind nutrition and weight loss. Honestly, although I know bits and pieces, I’m not really that interested in the technical aspects of food and hormones – but I do love me a good cook book. First of all, this book is US-centric. The food style is very American – things like black bean chilli, chicken salad, muffins, American pancakes, and the like. I think of it as modern classic style, the sort of thing you might get in an upscale American restaurant. This does mean that some of the ingredients are rare as hen’s teeth here (jicama, anyone? ), or simply unfamiliar (black beans), but I’ve not found a great deal of difficulty in following the recipes, as I cook quite often from American sources. Secondly, Jillian has some food foibles that are also fairly US-centric. She’s not keen at all on dairy unless it’s organic, because of growth hormones that are given to cows in America, which can then leach into dairy products. As far as I’m aware, these hormones are banned in Europe, so that’s one thing we don’t have to worry about. Jillian is also big on organic, which is a whole other discussion – but needless to say, if you’re not into organic, the substitution to non-organic is a no brainer! There are a few little other quirks, like a ban on strawberries, soy and pine nuts, because of their goitrogenic effects – this is the one I always break out when I want to emphasise what a minefield nutrition science can be. No matter what the food, there will be studies on the one hand showing it’s healthy, and on the other hand, showing it’s poison and will most likely cause you to get fat and die. This is why I tend to give myself free rein to make my own decisions – which means I can eat ice cream whenever I want – but that’s by the by! As far as I’m concerned, the biggest downfall of this book is the lack of pictures. There, I said it. I know I’m not the only one who loves a good picture of the finished recipe. There are few books in my collection that I regularly refer to and tolerate despite a lack of pictures, and this is one of them (with USA by Sheila Lukins being another real favourite of mine). If no pictures is a deal breaker for you, then I’m afraid you’ll be missing out, because this is one of the most appealing diet books in my collection. For a start, the titles of the recipes alone are enough to conjure up a mental image of what the finished dish will be like – and they sound beautifully appetising. How about greek yogurt cup with quinoa crunch and berries for breakfast, followed by tomato sandwich on garlic-rubbed toast for lunch, with spicy mahi-mahi and mango tacos for dinner? Don’t forget one of those famous fudge brownies for dessert! Seriously, the fudge brownies, along with the black bean chilli, seem to be the two dishes that Jillian most often refers to when she talks about her recipes, so I have an inkling that these are the two she makes most often herself! Another reason I love this book, apart from the cooking style, and the gorgeous descriptions, is the fact that each recipe comes with health info about what benefits you can get from eating each particular recipe. Those fudge brownies? Not only do they improve your mood (well, that’s a given, right? ), they also boost your metabolism, are heart healthy, AND anti-cancer. Now. Who would have thought a little brownie could fight cancer? To be honest, I feel like I’m taking these claims in the spirit they are intended – these brownies aren’t going to cure cancer, or even stop you getting it – but let’s face it, if you’re passing up a full butter, white sugar version for this honey-sweet, whole-wheat version (with added applesauce! ), then you’re going to give your health a bit of a boost. Steel-cut oats cooked with almond milk, and topped with cooked apple with cinnamon and maple syrup, and toasted pecans. I substituted steel-cut oats for porridge oats, and found that cooking apples were probably better here than eating apples, which didn’t break down and stayed as solid lumps. However, this is a really tasty breakfast – although at 280 cals, was quite high for me. Berries atop greek yogurt, drizzled with honey and topped with a mixture of quinoa, flaxseed, honey and olive oil, which has to be toasted in the oven. I bought flaxseed just for this, to try it out, and the combo of the flaxseed and quinoa had an interesting, slightly dusty taste with a tang of nutty, almost sunflower seed aftertaste. You end up with a lot of the quinoa crunch, and if you’re the only one eating it, then the listed storage time will run out faster than you can eat it – although I’ve stored it longer than that and had no problems. This is 216 calories, most of which come from the crunch topping. American pancakes made with rolled (porridge) oats, whole-wheat flour, almond milk, yogurt, buckwheat flour and cinnamon, served with berries softened in maple syrup. I’m a huge fan of buckwheat pancakes, so I really wanted to try this – and I love maple syrup, too! You end up with three small pancakes and 1/3 cup of berries per serving, for 340 calories, so this is fairly high. The recipe also makes enough for 6, so I’ve frozen some – we’ll see what happens when I defrost them! This is what I’d break out for a ‘special’ breakfast, but when I made them the first time, we ate far more than the serving size, as I didn’t find them all that filling. They were tasty, in a wholesome ‘you can feel this is good for you’ kind of a way. This makes enough for two, so was a ‘make two, eat one now and save the other for tomorrow’ deal for me. It’s a combination of tinned pink salmon with yogurt, onion, honey, lemon and curry powder, on top of lettuce and cucumber in a pita pocket. Very tasty, although I’m always a bit weary of curried fish. This was definitely filling, thanks to the addition of the salad, for 264 calories. This is one of my favourites. For a start, I’m a fan of American style chicken salad, with grapes and a mayo dressing. Not surprisingly, this ditches the mayo in favour of yogurt, honey and cider vinegar, and bulks out with celery. You can either eat this as a half cup for 118 calories, or as a sandwich for 209 calories, and I thought it was delicious. The serving size was a bit small, though, but with the low calorie count, you can definitely double up! This was probably the only recipe that actually disappointed me. I’m not sure what I was expecting, as the recipe is fairly simple – just fresh herbs, garlic, oil, and lime juice, and grilled fish with tomatoes and mushrooms. Very clean tasting – but definitely the sort of food you think ‘diet time!’ when you eat. Low in calories for a main meal, though, at 236 calories – but that doesn’t include carbs. Of all the recipes in this book, this is the one I was most intrigued to try, because it’s the one that I’ve heard Jillian mention. I make a damn good chilli myself, that I love, which is about 448 calories per serving, not including rice. So, that’s pretty high! But Jillian’s is a carb fest, with black beans, thickened with bulgur wheat (which is listed as ‘medium-grind bulgur’ – I hope I substituted correctly! ), so no need for additional rice – plus, it’s 297 calories a serving. It’s got a blend of spices and herbs including chilli, cumin, oregano, garlic, cinnamon and pepper, and also contains onions, green peppers, canned tomatoes, honey and orange juice. The main reason for me delaying making this for so long (I’ve had the book for over a year, and only made the chilli this weekend) was the addition of chopped chipotle chilli in adobo, which is a smoked jalapeno pepper in tomato sauce. I still haven’t found any of these, so I substituted a dried, then reconstituted, chipotle chilli. You could also probably use smoked paprika for the same kind of effect. Once you’ve made your chilli, the bulgur wheat makes it look pretty weird, and also soaks up all of the excess liquid, so it’s not runny at all. Again, the portion sizes are fairly small (the batch makes 8 servings), so when I made it, I bulked it up with a home-made salsa of chopped tomatoes, coriander, spring onions, lime juice and raw garlic. Jillian recommends you add toppings of non-fat yogurt, chopped spring onions, coriander and lime wedges anyway, so a spoon of salsa and 50g of non-fat yogurt did for me! It was fairly satisfying – again, one of those meals that tastes ‘wholesome’ rather than totally indulgently delicious. I have to be honest and admit I don’t remember what this really tasted like. Very basically, it’s mashed sweet potatoes and coconut milk, with a dash of cinnamon. I love sweet potatoes, so I have no doubt this went down a treat. Par for the course is Jillian’s dairy substitution for coconut milk, though! A blend of a banana, almond milk, almond butter, vanilla extract and ice cubes – Jillian also calls for ground flaxseed and I never add this – I just don’t really want to spoil the taste, because this is absolutely delicious. I’d go so far as to say this is actually better than a banana milkshake made with ice cream, which can be a bit too rich sometimes. I also have left out the almond butter, which doesn’t make a great deal of difference, but it’s definitely better with! I love this treat! Another massive favourite of mine, this is really simple but so delicious. This is just a combination of plain yogurt, vanilla extract, lemon juice, honey, and an orange. You’re supposed to add lemon zest as well, but I often leave this out. As with many other recipes that call for Greek yogurt, I always just use normal, low-fat, plain yogurt. I can’t believe that such a seemingly simple mix of ordinary items can taste so good. Delicious! A blend of honey, cocoa powder, white whole-wheat flour (I just used whole wheat flour, which I think is possibly the same thing! ), apple sauce, olive oil and an egg, which is baked in a pan. Each brownie is 86 calories, and you can freeze these pretty well. They have a chewy, nutty texture, because of the flour, and are super sweet, because of the honey. They’re delicious – but they don’t have that crispy top, chewy bottom texture that real brownies have. I still really like these for a sweet treat, though – they’re great heated up and served with a scoop of low calorie ice cream! So, there’s my review of the recipes I’ve created from this book. I highly recommend it for anyone who wants to eat more healthily, or lose weight. 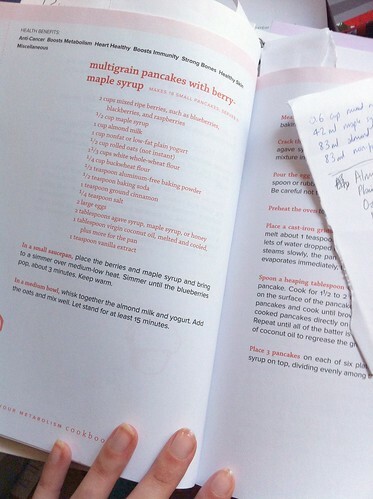 Despite the lack of pictures, this is a lovely book – and I know Jillian often uses recipes from it in other projects, such as her new Body Revolution programme, and her Freshology delivered meals use some of the same recipes, too. Get a head start and get the book! The cookbook sounds very interesting, the only thing is many recipies include meat, which I don’t eat. Having said that I guess you could modify the meals and still get a good result. Enjoyed the post very much!